In an exciting finale a playoff was needed to determine the winner of the First National Coast & Country Jamberoo Mixed Open after the teams of Kay Brennan/Bruce Byers and Liz Armstrong/Arthur Bosanquet both finished regulation play tied on 81. 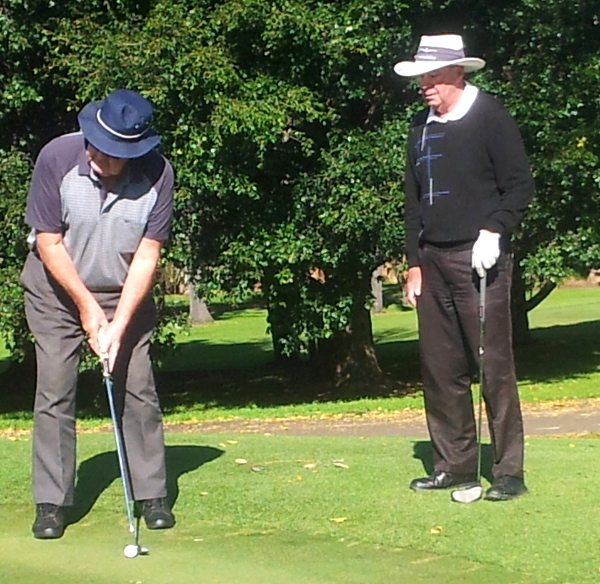 In the 4 hole playoff Kay and Bruce started well and opened up a 3 stroke lead after the first two holes. Both teams pared the 3rd leaving the dangerous fourth hole to determine the winner. Both Kay and Bruce’s tee shots were troublesome and when Arthur fired a long drive straight down the middle the pressure was applied. Kay responded with a well struck second shot but trouble loomed as it clipped the trees on the right. Fortune favours the brave as they say and the shot cleared the water leaving Bruce with a shot to the green, which he struck purely to the back of the green. Liz played a nice shot as well but it just rolled off the side of the green leaving Arthur with a difficult chip shot that he needed to hole. It was well played and only just missed the hole but it did allow Kay to roll her putt to the edge of the hole where Bruce tapped in for the victory in front of the appreciative gallery who had gathered. This marked the culmination of a great day’s golf in the interesting Canadian Foursomes format. Several teams came close in the end but Kay and Bruce were deserved champions. The nett event was tight as well with team O’Brien (Judi and Gus) getting the nod with a good score of 68.125, exactly 1 shot clear of runners up Louise Stoddart and Paul Henderson. All teams had a very enjoyable day [despite the golf some might add] with the fellowship shared among friends in the after golf celebration a highlight. I would like to thank Stuart Potter for his BBQ skills, Margaret and Lorraine for readying the meal and Marie for preparing the food and the scones. Thanks also to our sponsors First National Coast & Country at Kiama for their generous support. Yes it must have been nail biting ..Well done Kay and Bruce and great effort Liz and Arthur…Not to forget all competitors,sponsors and helpers.. Thanks especially to Dave and Stuey for the work they continually do behind the scenes, lets hope we can create some more interst for these events in the future to help repay their dedication.